This post is sponsored by Lisa Ann Skincare. Now you can enjoy chocolate without worrying about calories! 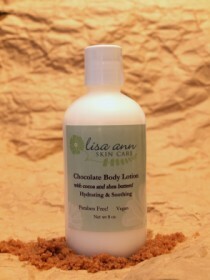 The Chocolate Body Lotion from www.lisaannskincare.com is a decadent treat for your skin. Lisa Ann Skincare uses only premium ingredients, such as Fair Trade unrefined shea butter, cocoa butter, aloe, coconut oil, olive oil and essential oils, all designed to sink into your skin easily to give you all the moisturizing you need. This scrub is for the true chocoholic! When you can’t get enough chocolate you can now enjoy Chocolate Body Scrub. Lisa Ann Skincare has taken cocoa powder and chocolate extract and mixed it with sugar, cocoa butter and oils to make a delightful exfoliating treat for your body. No Parabens, petrochemicals, sulfates, phlatates. As a special offer, Cupid’s Pulse will give away a bottle of Chocolate Body Lotion to one lucky reader! To enter, tell us your favorite chocolate dessert in a comment below. Please be sure to use your real email address so we have a way of contacting you if you’ve won — don’t worry, your address won’t be shown and we will never spam you. This giveaway will run until 11:59 PM EST on Saturday, Feb. 26. We will email you at the address you provided if you’ve won. Good luck! Keep up with Cupid on the go by following us at @CupidsPulse. Thank you for reading The Product Beat! Visit us weekly for new products and offerings.